✓ SIZE The wheelchair Bag is 12 inches wide X 12.5 inches tall X 4.5 inches deep. The bag is designed to expand an additional 3-4 inches when it is loaded with items. ✓ DURABILITY - Double-stitched seams and reinforced stress points. Designed to last a lifetime. ✓ VISIBILITY - Two reflective stripes makes you visible from up to 100 meters at night. 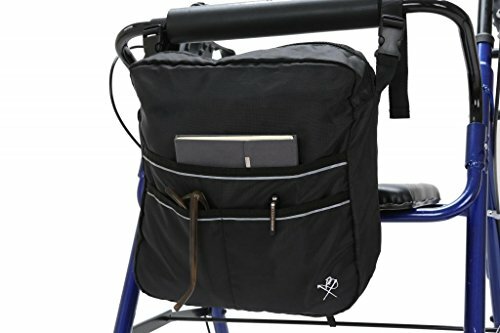 ✓ UNIVERSAL FIT - Two adjustable and clip on/off straps allow this bag to be quickly and easily connected to nearly any mobility device. ✓ EASY TO USE ZIPPER - The bag features a high quality zipper with a large 'O' pull for ease of use. ✓ EASY CARE - Machine washable. Machine washable. For best results, wash on cold and air dry. ✓ WATER RESISTANT - Crafted from 70-Denier DuroTec nylon fabric that is lightweight, extra strong and resistant to water. SIZE - The wheelchair Mobility Bag measures 12 inches wide X 12.5 inches tall X 4.5 inches deep. The bag is designed to expand an additional 3-4 inches when it is loaded with items.